More than two months after Seattle Pain Centers was abruptly closed, more than 1,500 former patients have sought care in emergency rooms and hundreds more have swamped existing programs. More than 1,500 former patients of Seattle Pain Centers have sought help in Washington emergency rooms since the chain of clinics was closed abruptly in July — and hundreds more have swamped local hospital programs. Some providers say they’re struggling to meet the void left when the center’s medical director, Dr. Frank Li, was stripped of his medical license for practices that state regulators said possibly contributed to the deaths of at least 18 patients since 2010. And some patients say they’ve been abandoned with no care for legitimate and agonizing pain. Currie said he’s on a waiting list for care at the Swedish Medical Center pain clinic. Officials there estimated they’ll be able to take outside referrals within three to four months. Flooded with people such as Currie seeking care, pain clinics across Western Washington have stepped up to absorb patients: about 800 so far at the University of Washington Medical Center, 600 at Swedish, 500 more at the Washington Center for Pain Management, officials at those sites said. Virginia Mason Medical Center and Group Health Cooperative have accepted patients, too. But that’s still not enough to handle the estimated 8,000 patients receiving opiate painkiller prescriptions from Li’s clinics this year — and up to 25,000 treated since 2008 at Seattle Pain Centers’ eight sites across Washington. “As this rolls out and we have more and more patients who can’t get care, this will be a crisis,” said Dr. Steven Stanos, medical director for Swedish Pain Services. Even before Seattle Pain Centers closed, there weren’t enough resources to manage chronic pain, he added. Officials said the real peak of patients may not be seen until next month, when prescriptions issued in mid-July begin to run out. There have been no reports of deaths or other serious consequences from abrupt opiate withdrawal, officials with the state Department of Health said. But neither the department nor the Washington Health Care Authority, which oversees Medicaid, are notified when such deaths occur, agency officials said. Officials do know that more than 1,500 former Seattle Pain Centers patients have sought care in emergency departments across the state between Aug. 17, when tracking began, and Sept. 18. That’s about 47 visits to ERs every day, a state report showed. The visits have been clustered in many of the communities the centers served. At least 143 former patients sought care during that period at Providence Regional Medical Center in Everett, with 88 showing up at Providence St. Peter Hospital in Olympia and 78 at St. Clare Hospital in Lakewood. The tracking doesn’t include information about diagnoses, so they could have come to the ERs for services unrelated to pain care, said Dr. Nathan Schlicher, president of the Washington chapter of the American College of Emergency Physicians. So far, the numbers appear stable, with no spike to prompt serious concerns, Schlicher said in an email. “In the end, the rate is probably about the same as the overall Medicaid rate,” he added. 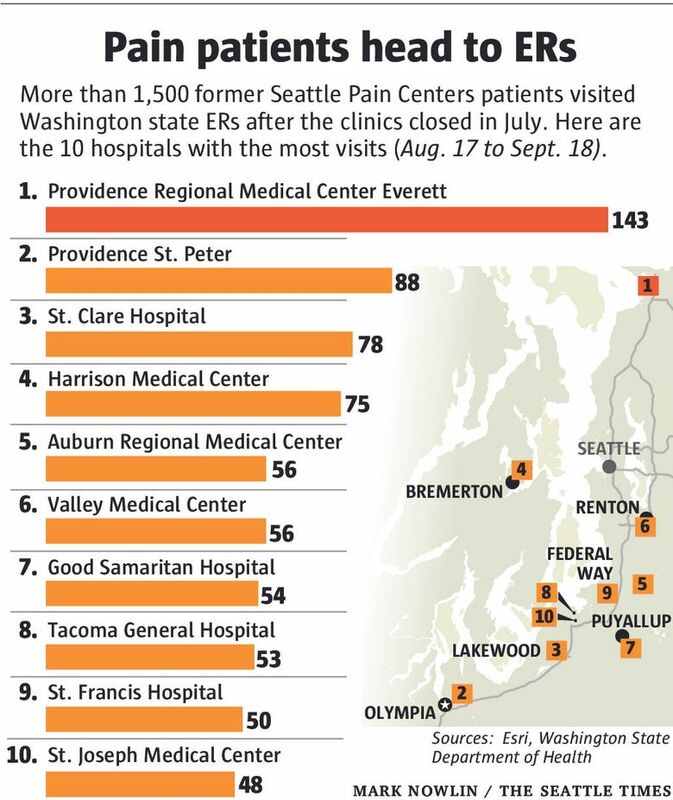 In Everett, former Seattle Pain Centers patients who came to the Providence ER were told to go back to their primary-care providers, or PCPs, said Dr. Kevin Clay, ambulatory-division chief. 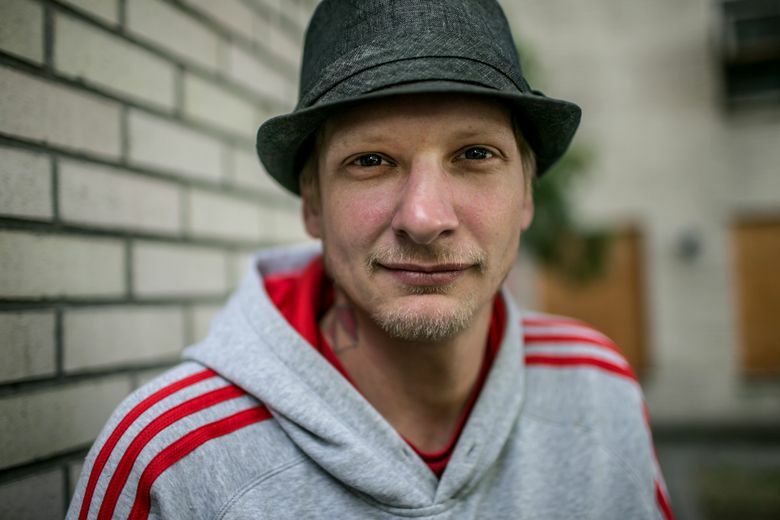 “If somebody didn’t have a PCP, they were distributed equally around the community,” he said. Some have been on very high doses of opiates, well over the 90 milligrams of morphine-equivalent drugs per day suggested by the Centers for Disease Control and Prevention or the threshold of 120 milligrams morphine equivalent included in Washington state rules. Those patients are being referred to private pain specialists, while others are sent to general practitioners, Clay said. “This could have been a huge crisis here, but everybody’s stepped up,” he said. Elsewhere in Washington, some patients said they remain very alarmed. Toni Beerbower, 42, of Hoquiam, said she went to the ER at Grays Harbor Community Hospital in August after Seattle Pain Centers closed. Doctors at Grays Harbor turned her away, she said. Hospital officials refused to comment on her claims, even with authorization to discuss her medical care. “We never turn away a patient from the ER for any reason and would have given a patient who needed pain management a referral to a physician who would find them the most appropriate pain-management clinic in the area,” hospital spokeswoman Nancee Long said in an email. Beerbower said she has since found a primary-care provider who won’t prescribe opiates. “She absolutely refuses to do it, period,” she said. The doctor did not return calls seeking comment on Beerbower’s case. Beerbower, who has an 11-year-old son, said she has trouble with daily tasks and can’t sleep because of the pain. For the first time in her life, she said, she tried marijuana. “I was totally relaxed and slept in until 6 a.m. without waking up and having massive anxiety,” she said. 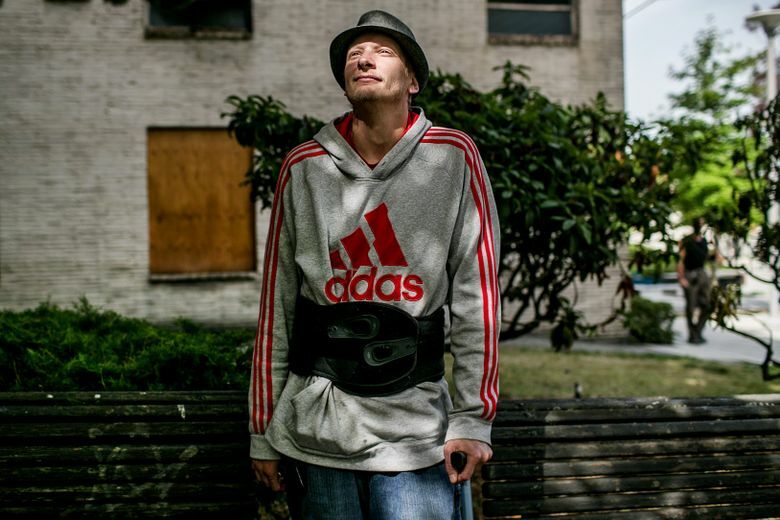 Despite pleas from state health officials to help treat the former Seattle Pain Centers patients, many in primary care have refused. That concerns Dr. David Tauben, chief of pain medicine at UW Medicine. “What’s happened is opioid challenges frighten so many primary-care people into not providing care at all,” he said. Tauben, Stanos and others are working with the Washington State Medical Association to reach out to primary-care providers and specialists to urge them to follow state recommendations to help. They’re also working on other solutions, such as telemedicine sessions to walk providers through the toughest cases. Helping the pain patients is the only compassionate stance, Tauben said. It could take months to settle all of the patients into new medical homes, the experts said. Meanwhile, Li, 48, has not yet responded to the statement of charges levied by the state Medical Commission. The agency alleged that Li failed to properly monitor prescription use of powerful opiates, possibly contributing to patient deaths. His medical license remains suspended in Washington and in California, where he also practiced. Nor has he responded to Drug Enforcement Administration (DEA) officials seeking to formally revoke his ability to prescribe powerful narcotics. A hearing on his DEA registration is set for Nov. 8, an agency spokeswoman said. A lawyer representing Li did not respond to a request for comment. The Seattle Pain Centers closure sparked a “health-community emergency,” said Dr. Patricia Read-Williams, chief of the UW Medicine Neighborhood Issaquah Clinic, which has seen several former clinic patients. There have been exceptions, but most providers are doing their fair share, she said.